After a star is formed, from a gravitationally condensing cloud of gas and dust, it will start to burn the hydrogen in its core to produce helium via nuclear fusion. Most stars, will generally remain fairly stable for the majority of their lifespan, gradually burning through their supply of nuclear fuel. These types of stars lie within the central diagonal “main sequence” band of the Hertzsprung-Russell diagram – a plot of the colours of stars verses their luminosities. The colour of a star is linked to its temperature (see Black-Body Radiation on the Quantum Mechanics page) and the hottest, most massive stars will radiate at a peak wavelength in the blue and ultraviolet end of the spectrum, whilst less massive stars are cooler and will radiate more towards the red end of the spectrum. 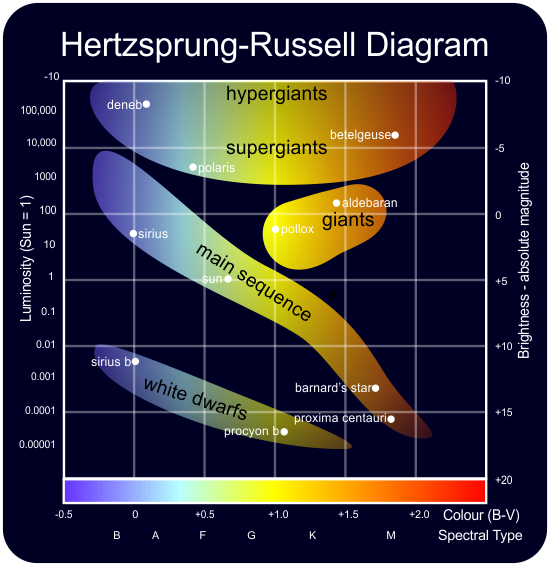 Massive, hot, blue, main-sequence stars, are found on the top left of the Hertzsprung-Russell diagram, while less-massive, cooler, red stars are found on the bottom right. Around 90 per cent of stars in our galaxy are on the main sequence. Main-sequence stars can have any spectral class, (i.e. temperature), O, B, A, F, G, K, M in the Morgan–Keenan (MK) system. However, all main-sequence stars share the luminosity class V in the MK system. Main-sequence stars are unofficially (and historically) know as dwarf stars, as opposed to giant stars. However, this is somewhat of a confusing term, as blue stars on the main sequence are among the most massive stars and do not necessarily vary significantly in size when they reach the blue giant stage of their evolution (see below). Also, the term “white dwarf” is used for a class of older, dying stars that are no longer on the main sequence (see below). The Sun is an example of a main-sequence star, unofficially known as a Yellow Dwarf, and classified as a G2V star in the Morgan–Keenan system. A main-sequence star steadily burns through its supply of hydrogen in its core, via nuclear fusion, creating helium in the process. Eventually, all of the hydrogen will have been converted to helium and the star’s core will start to cool. With a lower core temperature, the gravitational pressure from the outer layers of the star will cause the star to collapse inwards, until the temperature increases again to a point where hydrogen can start to burn in a layer surrounding the core. When this happens, the luminosity of the star will increase by anything from 1,000 to 10,000 times, causing the outer layers of the star to expand to enormous distances. Stars of this type, are known as a red or orange giants. The dimensions of red giants compared to their original main-sequence stars can be enormous. For example, Aldebaran, the “bull’s eye”, in the constellation of Taurus, is an orange giant of around 1.5 times the mass of the Sun, however, it is around 44 times the Sun’s diameter, and over 400 times the Sun’s luminosity, due to its much larger size. The Sun, itself, will become a red giant in around five to six billion years from now, expanding to around the size of the Earth’s current orbit. If a main-sequence star has a mass of around 10 to 30 times the mass of the Sun, it can evolve to become a red supergiant, through a similar process to the evolution of a red giant, described above. These are some of the largest stars known, with the red supergiant star UY Scuti having an estimated radius of around 1,700 times that of the Sun. Betelgeuse, in the constellation of Orion – the ninth brightest star in the night sky – is a red supergiant of around 1,000 times the radius of the Sun. Red hypergiant stars are similar to supergiant stars, although the term is not well defined and is not usually used by astronomers. The term red hypergiant is commonly used, however, for the most massive and luminous red supergiants, with an absolute magnitude brighter than -7. However, it has also been suggested that the term should be used only for red supergiant stars with particular spectral signatures. The term yellow hypergiant is more widely accepted by astronomers for massive, yellow stars of absolute bolometric magnitude of around -9. The luminosity class 0, or alternatively Ia-0 or Ia+, identifies a hypergiant. Blue giants and supergiants have a spectral class of O, B or A. This section is currently incomplete. Please call back soon. Wolf–Rayet Stars are massive stars showing emission lines from highly ionised helium and nitrogen or carbon, indicating extremely high surface temperatures. Wolf–Rayet stars can form from various different types of stars, and there are numerous sub-classifications. The most massive main-sequence stars are WNh-class Wolf-Rayet stars, producing nitrogen, carbon and oxygen, via nuclear fusion, even while still burning hydrogen in their cores (hence the appended h in their class name). The most massive and the most luminous known star is the WNh Wolf-Rayet star known as RMC 136a1, in the Large Magellanic Cloud. RMC 136a1 is over 265 solar masses and 8.7 million times the luminosity of the Sun, with an absolute bolometric magnitude of −12.3 to −12.5. Wolf-Rayet stars can also evolve from particularly massive red or yellow supergiants (around 20 solar masses and above), which will not generally explode as supernovae at these stages. Wolf-Rayet stars are often surrounded by a nebula, similar to a planetary nebular, indicating that they have shed mass. It is suspected that most Ib and Ic supernovae have Wolf-Rayet stars as their progenitors. A carbon star has a bright ruby red appearance, due to an atmosphere that contains more carbon than oxygen. They are usually red giants, although some carbon stars are dwarfs or supergiants. White dwarf stars are the remnants of red giant stars that were not large enough to explode as a supernova. Brown dwarfs are small stars, up to around 70 to 80 times the mass of Jupiter, that are not massive enough to sustain fusion of hydrogen to helium. Brown dwarf with over 13 Jupiter masses are hot enough to fuse deuterium (hydrogen with a neutron as well as a proton in its nucleus) to helium, however. See the main article Variable Stars. Neutron stars are the highly compressed remnants of dead stars, produced in supernova explosions. See the main article Neutron Stars.